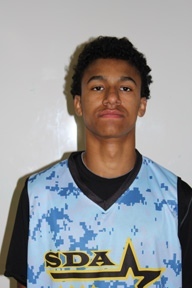 One of top 2016 Point Guard’s on the West Coast Justin Moore of Mission Bay HS of San Diego, California. Justin has been showing out grabbing major attention from college recruiters and media outlets. Mid Major Hoops Report has brought him to our “Players Corner” where we at MMHR are proud to highlight him as one of the fastest rising prospects in the 2016 Class…. “Savvy Handle, quick first step who can shoot the ball off the dribble and has accurate three point shot. High Major upside.” – Ladell Hill Jr.
MMHR: What is your Height, Weight, and Position you play? MMHR:How is your season coming along, so far? Is it living hpupto expectations? Justin Moore: I’m doing pretty well. I think I’m living up lto my expectations but theirs always room for improvement and I can always get better! MMHR:Which college programs have been to your games and practices so far this season? MMHR: I have offers From SDSU, USC, GSU, USD and Vanderbilt is recruiting me the hardest right now. Justin Moore: Education is first in my family, I want to be coached by Great coaching staff, Best fit for my playing style, Where I can earn the chance to play. I’m all about winning!! so a winning program. Justin Moore: No, i dont at this time. I am focused on my HS season right now. Justin Moore: Hopefully, the NBA Top 100 Camp, Lebron Skills Academy, Deron Williams Skills Academy, and Pangos All-American Camp. Justin Moore: My strong points in my game right now would be passing the ball, good ball handler, floor general, getting to the basket and my defense. Some of my weaknesses that I’m working on is being more of a vocal leader and my jump shot. MMHR:What AAU team are you associated with? Justin Moore: 6 days a week. Justin Moore: My mom Nicole Moore, My older brother Chris Prather, My coach Marshawn Cherry and My best friend Lamarriel Taylor. Special thanks to the Moore family and Mr. Cherry for your time and Allow us to make this happen. Good luck, on the rest of your season. Please keep in contact with MMHR to keep track of your recruiting.